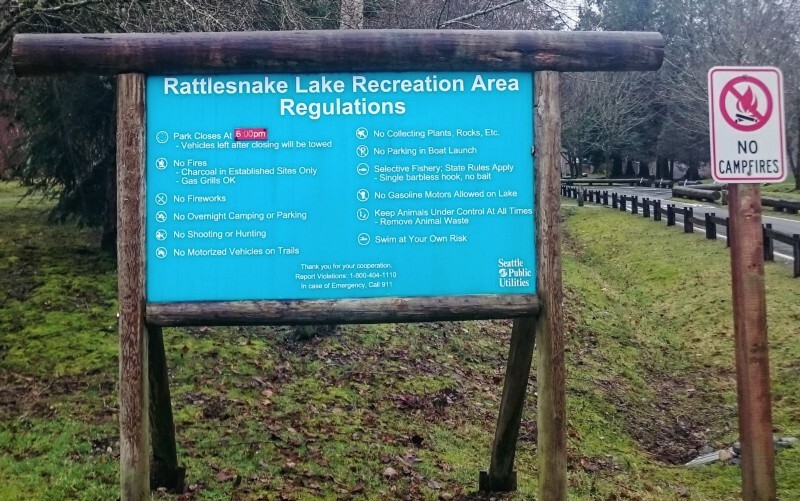 As you park at Rattlesnake Lake you immediately notice mountains to the south, east and northwest of you. You’re tucked into a nice little area right here with beauty surrounding you in all directions — mountains, forest, a lake. Rattlesnake Mountain is located to the northwest, across from the lake. 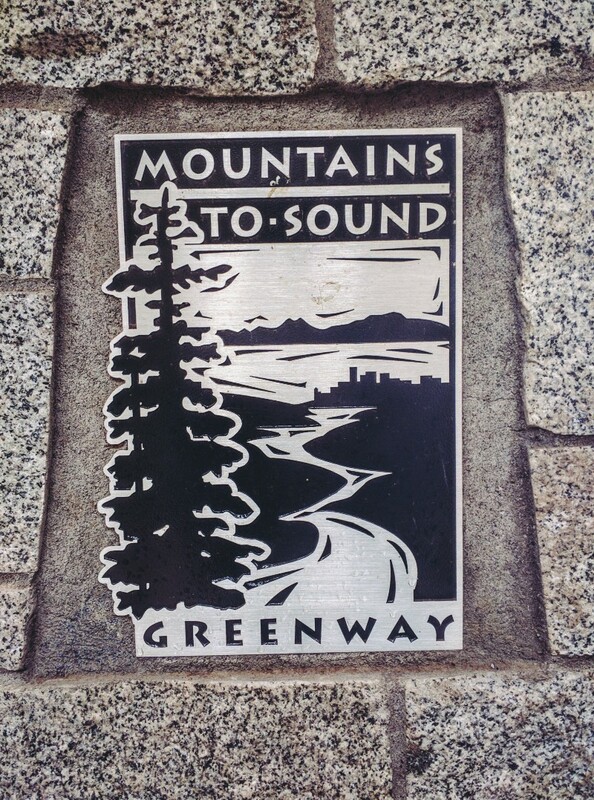 The mountain has a prominence of 2,520 feet. 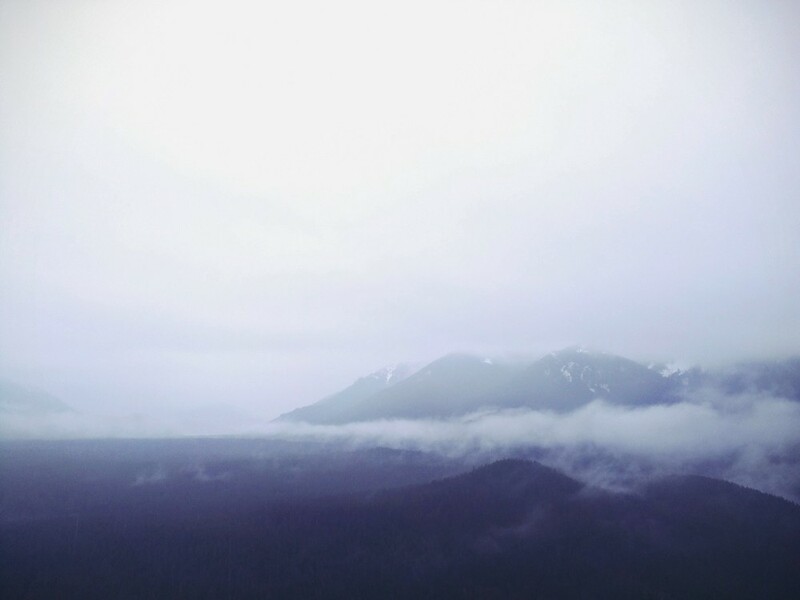 Rattlesnake Ledge, your hike for the day, is somewhere around half that. As you glance up at the mountain you notice three peaks atop it. They look spectacular. You wish today’s hike was to one of them — you can only imagine the views from way up there. However, knowing ahead of time that you wouldn’t be going to the top of the mountain you assume that today’s hike is somewhere in between those peaks and the lake below. You’ll tackle those another time when you’re more prepared and skilled. At least, that’s what you tell yourself. Surely it would take a lot of work to get up there. Surely. Fast forward to the height of your hike and you now realize that you’re actually at that lower third peak! How you got here so quickly, and somewhat easily, is a complete mystery. While looking down at the parking lot it seems nearly impossible that this was only a distance of 2 miles. Wow! The weather was overcast with light rain. It was 1:25 P.M. as we began our hike and the forecast called for the rain to cease in the next 1–2 hours. That wasn’t the case. The rain continued to pick up throughout the rest of the day. From the parking lot we traveled along a service road for about a 1/4 mile until reaching an open space next to the lake with about 12 restrooms, an information and history board, some geese, and the trailhead. We spent a little time with the geese before moving on. Once ready, we started out on the trail. The first thing we came across was an enormous boulder. This was the biggest of many along the first 3/4 miles of trail. The trail was in excellent condition. Well maintained, extra wide, no obstacles. Even on this rather wet day, the trail was impressively in tact. We came across about 10 others along the route. Some walking, others running. After the first mile or so the trail starts to become steeper and begins to switch back. We crossed over a few wooden walkway bridges, passed a creek in the distance, and had some views of the lake below through the trees. 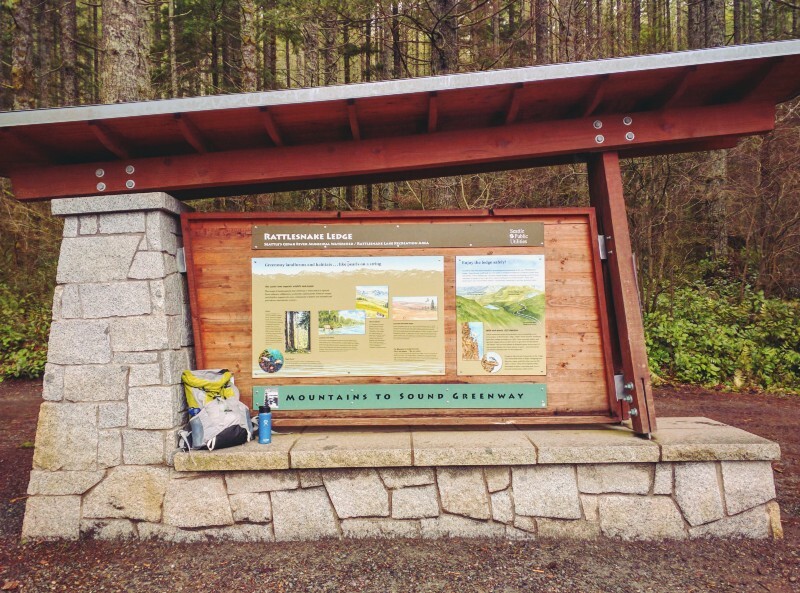 We took 2–3 water breaks before reaching a trail sign indicating that East Peak and Snoqualmie Point were to the left. 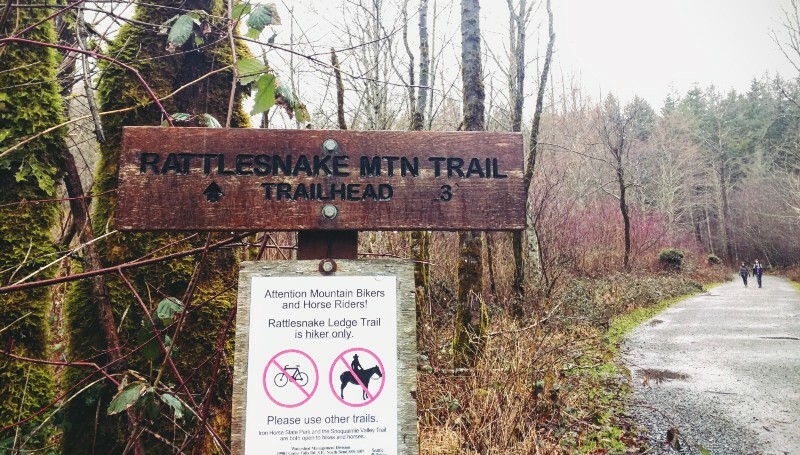 Another sign indicating that Rattlesnake Lake was behind us, on the trail we just finished. And a caution sign letting us know about steep cliffs. No sign telling us we reached our destination. There was a trail runner that came up from behind us and headed towards the right so that’s the way we also went. Before going too far we peaked over the edge right in front of us. Looking to the left we were able to see the other peaks. Looking out forward we could see trees and mountains in the distance. We proceeded hiking toward the right. Everything from here became rocky, climbing upwards a little bit. There was no visible trail. We kept going. We made it — Wow! The entire area is a rocky outcrop and fairly large. 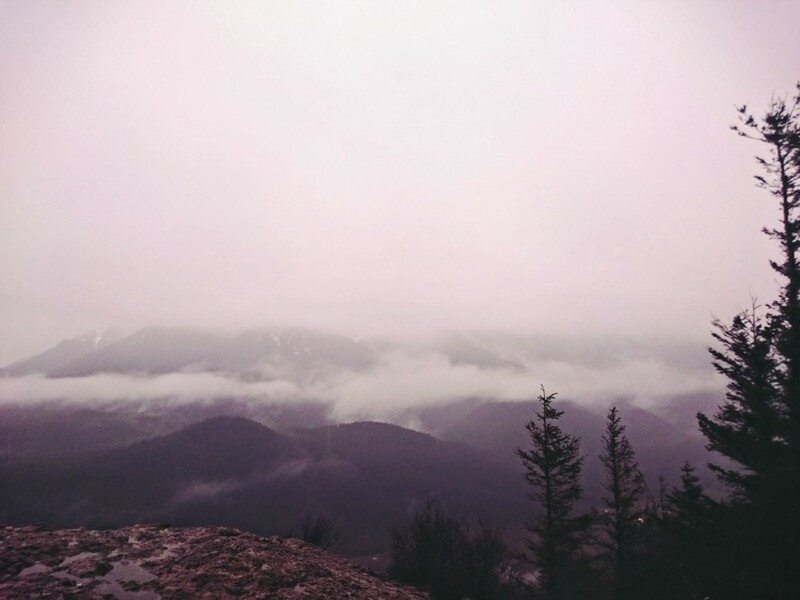 The views, even with the overcast sky, were amazing. We took some photos with our phones, which due to the rain, was very difficult since the water was messing up the touch capabilities on the screens (It’s about time to upgrade to a camera camera). We began walking closer towards the edge. Besides the trail runner, who at this point had already left to head back down, there were four others up here. All drinking from wine glasses. Sure, the view is well worth celebrating, but one of us would prefer a bottle of beer over wine :p Actually though, we overheard them talking about marriage, so they must have been celebrating something else besides the view. We continued walking about, taking photos, and edging closer to the edge. As mentioned above, this is a big area that could easily fit 50 or more people. As we inched further to the edge we quickly realized that the caution sign we saw earlier was not messing around. 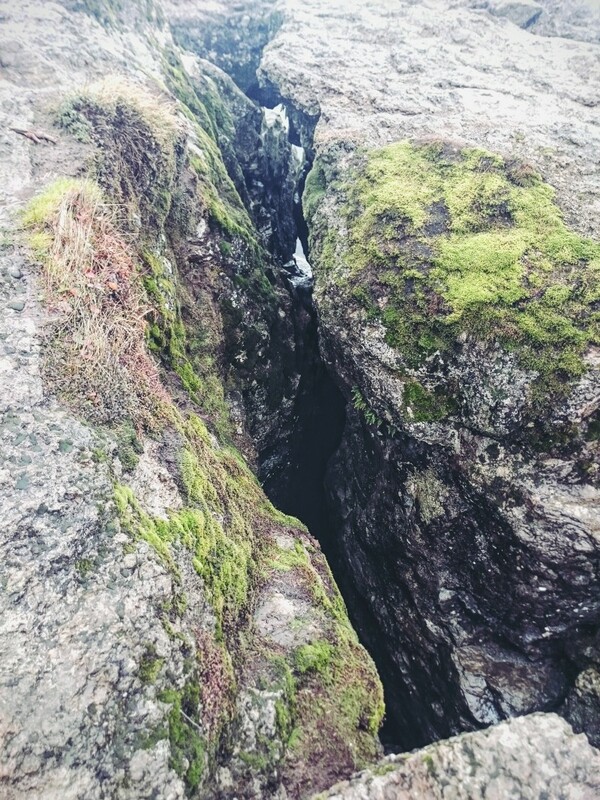 This was literally a sheer cliff with a straight drop down that’s over 300 feet according to the sign at the start. As a matter of fact, according to the Wikipedia page, there are some who have fallen to their deaths from up here. If you’re bringing children or dogs with you want to use extreme caution. After awhile two others made it to the top. With a total of only 8 people, including ourselves, we were pretty lucky that it wasn’t too busy. From previous articles we’ve read this trail is very popular. Surely the bad weather had a part in this. On a nice day, this would be a perfect picnic spot! Speaking of weather, halfway up the trail we removed our jackets as the rain wasn’t so bad and it was a bit of a workout getting up. Once here though, the rain had picked up quite a bit and it was time to put the jackets back on. We stayed for about 20 minutes before heading back. The hike down was easy and quick. We reached the Jeep at 4:15 P.M. That left us with a total trip time of 2 hours 50 minutes. 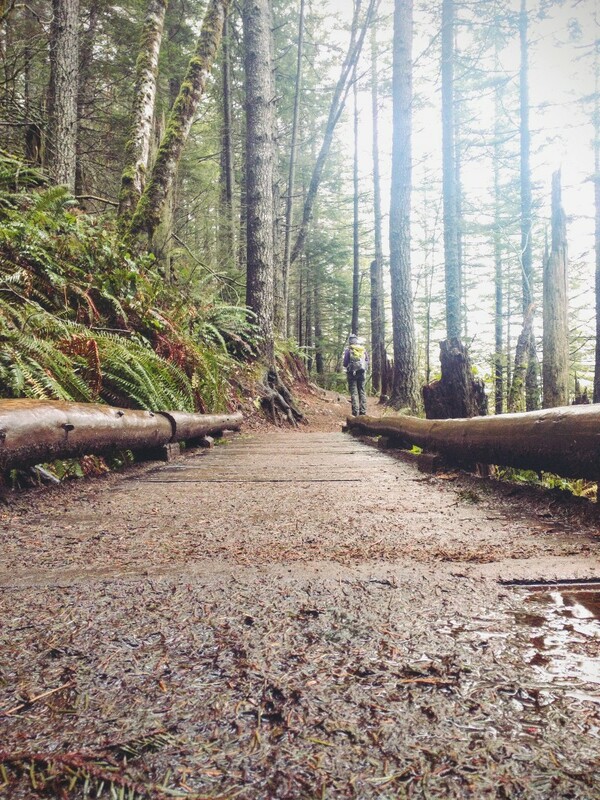 The payoff in panoramic views makes this trail a real win. Not crazy difficult, not terribly long and a really well maintained trail. Even with less than ideal weather, we had a great time. This is a trail we will revisit. When we return we plan to bag one of the other peaks too. 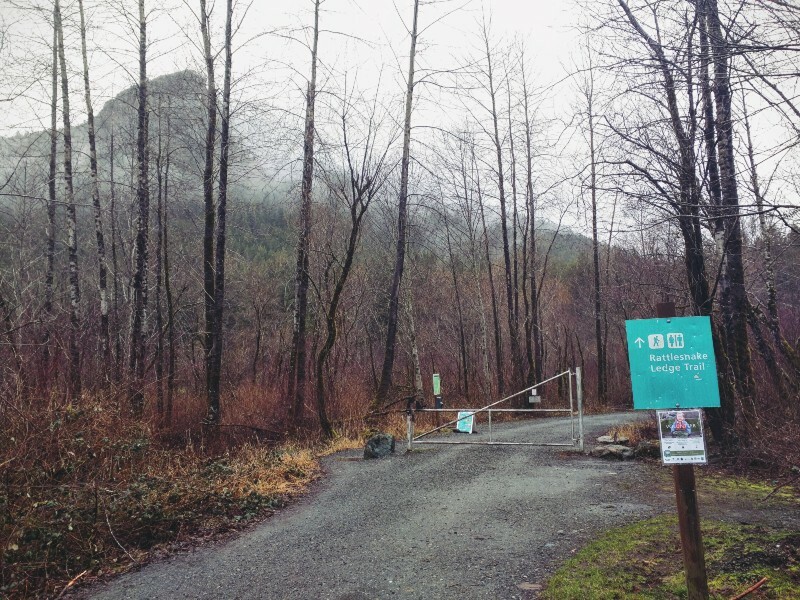 While Rattlesnake Ledge is one of the three peaks you can see from the parking lot, the true peak of this mountain is about twice as high and out of view from the parking lot — hence the confusion at first. 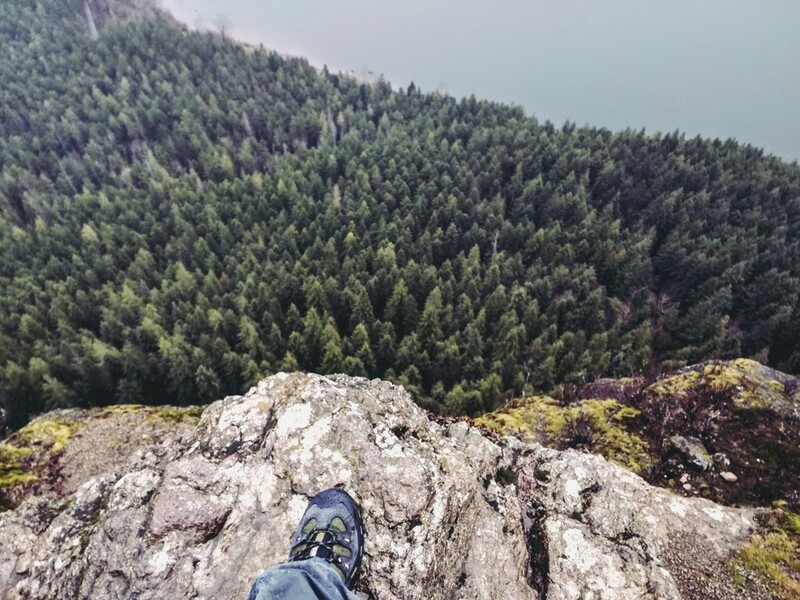 Have you been to Rattlesnake Ledge before? 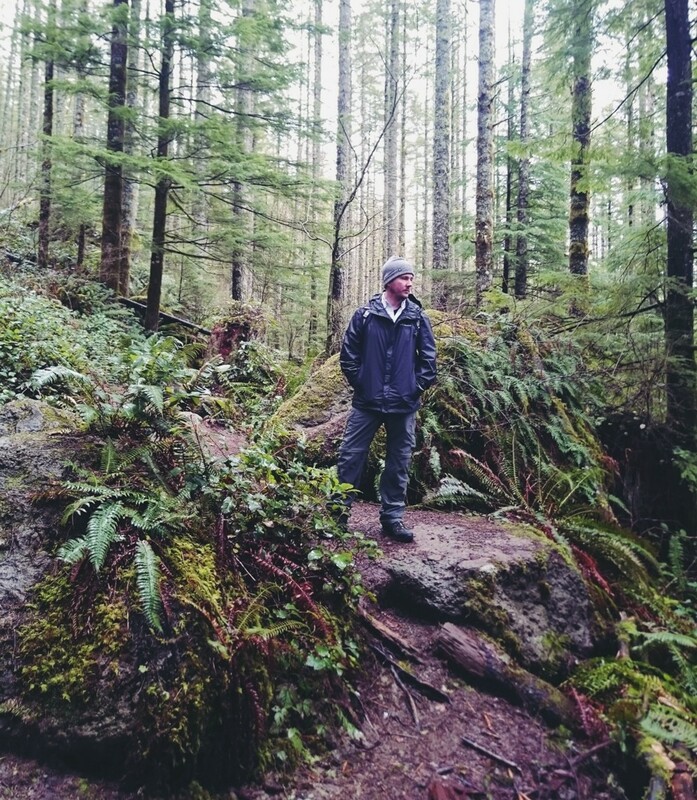 Let us know how your hike was in the comments below.